The right-wing, blue-state, affable governor who gets everything he wants. The drab Amtrak depot in Detroit, Michigan, was recently the venue for a truly surreal scene: A Republican governor accepted—gratefully—a check from the Obama administration. This was not just any federal funding, either, but $200 million for that most Europhiliac of abominations: passenger rail. Wisconsin’s Scott Walker, Ohio’s John Kasich, and Florida’s Rick Scott had all rejected the money. But here was Rick Snyder, the state’s new Republican governor, standing shoulder-to-shoulder with Carl Levin, John Conyers, and John Dingell, beaming genially and brandishing a giant check. “It’s about economic development,” Snyder said, “but it’s also environmentally sound, and it’s about great quality of life.” What was wrong with this guy? This wasn’t Snyder’s first deviation from the finger-in-the-eye style of governing that is now ascendant in the Republican Party. Since being elected last fall, he has refused to gut Medicaid, instructed his administration to implement the health care law despite his opposition to it, defended embryonic stem-cell research against conservative attacks, and conspicuously avoided the scorched-earth rhetoric on unions that is popular with most of his Republican colleagues. By all appearances, Snyder comes across as a moderate answer to Walker, Kasich, Scott, and New Jersey’s Chris Christie. But actually, that couldn’t be further from the truth. In his own mildmannered, nonconfrontational way, Snyder is doing a far better job than his more bombastic conservative peers of delivering on the contemporary GOP agenda. 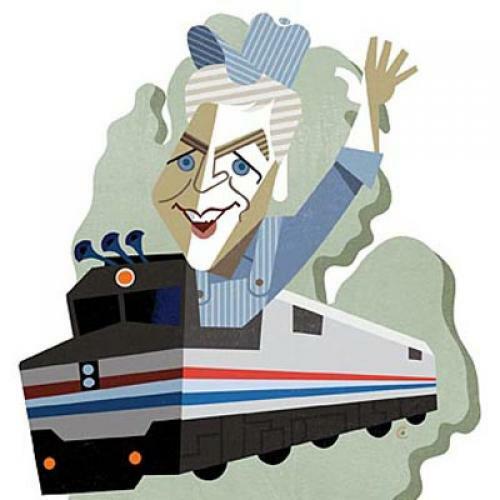 Snyder, a well-coiffed former Gateway executive turned venture capitalist, swept to victory last fall on the Republican wave, his own millions, and a platform of vague, upbeat generalities about Michigan’s renewal. His unobtrusive style is part wonky technocrat (he ran as “one tough nerd”) and part hokey motivational speaker (his governing slogan is “relentless positive action”). “I think we’re on a course that hopefully is a role model for other places,” he told me after a recent speech in Detroit. “And that course I don’t describe in terms of ideology or positioning. ... Spending time on blame-placing has no value. Spending time on taking credit for anything has no value. The only thing that has value is actually accomplishing results that solve the problem.” The problem, of course, is a proud and formerly prosperous state in dire straits: Michigan was the only state to lose population since 2000, and the unemployment rate topped 15 percent in 2009. Snyder’s solution has been a bracing dose of supply-side economics. In May, he signed a massive tax overhaul that slashes taxes on businesses so drastically it would make a Texan blush. A new 6 percent tax on profits is limited to 40,000 companies, mostly larger ones with stockholders, while 95,000 businesses are now off the hook for any corporate taxes at all. This deprives the state of $1.7 billion in much-needed revenue. Snyder is making up some of the shortfall by curtailing many targeted business tax credits—including film industry and clean-energy incentives favored by his Democratic predecessor Jennifer Granholm—and cutting aid to towns and cities. He also raised taxes on pensions, to the ire of many retirees. While Snyder hasn’t taken on public employee unions directly, he has signed a law with great potential to weaken them anyway—a vast expansion of the powers of “emergency managers” appointed to take over struggling cities and school districts, who will be able to break labor contracts, sell public assets, and dissolve entire towns or districts. One of the likely candidates for emergency management is Detroit, which, under Snyder’s plan, stands to lose much of the $176 million in aid it gets from Lansing. “It threatens the concrete but fragile gains we have made, and we simply cannot afford it,” said Mayor Dave Bing in a February speech. In addition, the plan slashes $300 million from K-12 education and nearly eliminates the earned income tax credit, at the cost of around $300 for the average poor family. Snyder also signed a bill making Michigan the first of several states to cut basic unemployment benefits from 26 weeks to 20. These are radical changes, and yet Snyder has met with only scattered protests and a wait-and-see stance from many of the left-leaning editorial boards that endorsed him in November. Admirers and rivals alike attribute this to his milquetoast manner. Instead of thundering about the evils of socialism, Snyder promises to govern by the “metrics” on his “dashboard.” He’s no great orator—his voice is high-pitched and slightly reedy—but he is adept at bathing his agenda, with its stark winners and losers, in unifying terms, urging audiences to fix Michigan’s “broken culture” by “overcoming divisiveness and getting [back] to inclusiveness.” For a self-described nonpolitician, Snyder is enjoying himself a lot: He speaks without notes, laughs at his own jokes, and deftly parries reporters’ questions. He likes to quip that his agenda has “helped the economy in the sign-making industry”—a joke that doubles as a subtle boast. The fact is, there aren’t that many signs being raised against him at all. Alec MacGillis is a staff writer for The Washington Post. This article originally ran in the June 30, 2011, issue of the magazine.